Charles Johnson, University of Washington professor and author ("Middle Passage"), has recently received an Academy Award in Literature from the American Academy of Arts and Letters. harles Johnson is the author of four novels Faith and the Good Thing (1974), Oxherding Tale (1982), Middle Passage (1990), and Dreamer (Scribner, l998); three collection of short stories, The Sorcerer's Apprentice (1986) Soulcatcher and Other Stories (2001), and Dr. King’s Refrigerator and Other Bedtime Stories (2005); a young adult book Bending Time: The Adventures of Emery Jones, Boy Science Wonder, co-authored with his daughter Elisheba and illustrated by Johnson; a work of aesthetics, Being and Race: Black Writing Since 1970 (1988); two collections of comic art, Black Humor (1970) and Half-Past Nation Time (1972); Black Men Speaking (1997), co-edited with John McCluskey Jr.; Africans in America: America's Journey through Slavery, the companion book for PBS' series (Oct., l998), co-authored with Patricia Smith (The Audio Book for this was selected as one of the best audio books in the History category of the Listen Up Awards in Publisher's Weekly); and King: The Photobiography of Martin Luther King Jr., (Viking Studio, 2000), co-authored with Bob Adelman. These works have been translated into eight foreign languages. As a cartoonist and journalist in the early 1970s, he published over 1000 drawings in national publications, a selection of which appears in Humor Me: An Anthology of Humor by Writers of Color by John McNally (University of Iowa, 2002). In l999 Indiana University Press published a collection of his essays on aesthetics, cultural criticism, articles, interviews, speeches, cartoons, out-takes from his novels and book reviews dating back to 1965, entitled, I Call Myself an Artist: Writings By and About Charles Johnson (April, l999) a "Charles Johnson reader," edited by Dr. Rudolph Byrd, with a final section of eight critical articles on his work. Turning the Wheel: Essays on Buddhism and Writing (Scribner) was published in 2003. The University of Washington Press published Passing the Three Gates: Interviews with Charles Johnson, edited by Dr. James McWilliams, a collection of interviews dating back to 1978, in 2004. In 2007, Johnson co-authored with Bob Adelman Mine Eyes Have Seen: Bearing Witness to the Struggle for Civil Rights (Time-Life Books), and in 2008 Remembering Martin Luther King, Jr: 40 Years Later, His Life and Crusade in Pictures (Time/Life Books); and his comic art appeared in The Writer’s Brush: Paintings, Drawings and Sculpture by Writers, edited by Donald Friedman. In 2010, he co-authored with Michael Boylan Philosophy, An Innovative Introduction: Fiction Narrative, Primary Texts and Responsive Writing (Westview Press). In 2016, he published a book on the craft of writing, The Way of the Writer: Reflections on the Art and Craft of Storytelling (Scribner). Forthcoming in May, 2018 is his 23rd book and 4th short story collection, Night Hawks (Scribner). In November 2014, he published Taming the Ox: Buddhist Stories, and Reflections on Politics, Race, Culture, and Spiritual Practice (Shambhala Publications). In January 2015 the 672-page Words and Wisdom of Charles Johnson was published by Dzanc Books, and in February 2015 the second Adventures of Emery Jones, Boy Science Wonder, titled, “The Hard Problem” was published by Booktrope. His most recent published interview, “Entangled Freedom” appears in the fall, 2014 issue of Iowa Review, along with the story he illustrated, “The Weave.” In January, 2015, the special issue he guest-edited for the American Book Review, devoted to “The Color of Children’s Literature,” was published. In July, 2015, Scribner published a Scribner Classic edition, in hardcover and paperback, to celebrate the 25th anniversary of Middle Passage. He has written over 20 screenplays, among them "Booker" (Wonderworks, 1985), which received the international Prix Jeunesse Award, a 1985 Writers Guild Award for "outstanding script in the television category of children's shows," and was released for home-video in 1996 by Bonneville Worldwide Entertainment. That show, along with "Charlie Smith and the Fritter Tree" (Visions, PBS, 1978), have been broadcast on the Disney channel. He was one of two writer-producers for "Up and Coming" (KCET, 1981), and earlier created, hosted, and co-produced "Charlie's Pad" (1970), a PBS how-to-draw series that ran nationally for a decade in the U.S. and Canada; and he hosted the 1992 KCTS (Seattle) series "Words with Writers." In November 2016, Pegasus Theater in Chicago premiered its adaptation of Dr. Johnson’s novel Middle Passage, with the title Rutherford’s Travels. He has published 57 reviews in The New York Times, Los Angeles Times, The Wall Street Journal, The Washington Post as well as other major newspapers in America and England and published numerous critical articles. Dr. Johnson drew a regular feature "LitCrits" for Quarterly Black Review and his comic art has appeared in Literal Latte, Buddha Laughing, The Seattle Times and The Seattle Post-Intelligencer. ; he also drew in 1999 a twice-monthly cartoon feature for Black Issues in Higher Education. Dr. Johnson has served as a fiction judge for the Pulitzer Prize (three times), National Book Award in fiction (three times and chaired the fiction panel twice) , PEN/Faulkner, Los Angeles Times Book Prize, the Drue Heinz, numerous other fiction prizes and for the Seattle Film Festival, is a nominator for the MacArthur fellowships, served on the Modern Library editorial board, and is a contributing editor for Tricycle: The Buddhist Review, and an Associate Editor of The American Book Review. He was a trustee for the Washington Commission for the Humanities and served as a board member for the Seattle Repertory Theater. He has served on the board for the Associated Writing Programs, directed their annual short fiction contest, and was director of the Northwest office for the Fiction Collective. In 1995 his novel Faith and the Good Thing was performed as a play by City Lit Theatre and the Chicago Theatre Company, and received two Black Theatre Alliance awards. He has granted 332 interviews for American and foreign newspapers, scholarly journals, radio, and television, and for Nigeria, South Africa, Singapore, Bombay, and Amman, Jordan via USIA. Dr. Johnson is one of l2 authors portrayed in a special series of stamps issued in November, l997 by the Inter-Governmental Philatelic Corporation; these stamps, created to honor the most influential black authors of the 20th century, will be distributed in the former Soviet Union, Asia, Africa, and South America. He has received both a National Endowment for the Arts grant (l979) and a Guggenheim Fellowship (l986).His novel Dreamer was a Book-of-the-Month Club alternate selection and a Quality Paperback Book Club alternate selection. Dr. Johnson has lectured in 9 countries (Eastern Europe, Asia, Spain and Portugal) for the US Information Agency and is a regular speaker at American campuses. He has delivered 398 lectures, readings, and addresses. In l997 Dr. Jonathan Little's (Alverno College) critical study Charles Johnson's Spiritual Imagination was published by the University of Missouri Press. William Nash at Middlebury College published Charles Johnson’s Fiction, in 2002 (University of Illinois Press). Gary Storhoff’s Understanding Charles Johnson (University of South Carolina Press) appeared in 2004. In 2005, Dr. Rudolph Byrd published Charles Johnson’s Novels: Making the American Palimpsest (Indiana University Press). In 2007, Charles Johnson: The Novelist As Philosopher was published by University Press of Mississippi, edited by Marc C. Conner and William R. Nash. In April, 2009 Linda Furgerson Selzer published Charles Johnson in Context (University of Massachusetts Press). African-American Review devoted its winter 1996 issue to Dr. Johnson's work, which has also been the subject of two special sessions of the Modern Language Association (1991 and 1996), and the International Association for Philosophy and Literature (2000 and 2001). 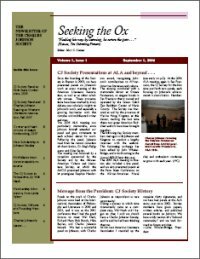 The first meeting of the Charles Johnson Literary Society was held on May 24, 2003 at the American Literature Association conference. (May 22-25, 2003). In 2011, Author’s Press in India published the festschrift book, Charles Johnson: Embracing the World, edited by Nibir Ghosh and Ethelbert Miller. A former director of the creative writing program at the University of Washington, he held an endowed chair, the S. Wilson and Grace M. Pollock Professorship for Excellence in English (the first chair in writing at UW), and is now professor emeritus. He served as fiction editor for the Seattle Review from l978-98. In 1995 he received an honorary doctorate in Humane Letters from Southern Illinois University, in 1994 an honorary Doctor of Arts degree from Northwestern, in l999 an honorary Doctor of Letters degree from the State University of New York at Stony Brook, and in 2006 a Doctor of Humane Letters degree from Lewis and Clark College. He sponsors the "Marie Clair Davis Award in Creative Writing," given to a secondary student at Evanston Township High School, and the Charles Johnson Student Fiction Award, a national contest, at Southern Illinois University. Please visit his Wikipedia page for more information.